What better way to poke a sharp stick in the reader’s eye than with the word “starch”? I want to get people’s attention and force a reaction. More importantly: “Starch” is the correct scientific term for the foods people need to eat. Until you realize that you are a starch-eater, the solution to your health and weight problems will remain elusive. Once you understand that the bulk of your diet must come from starches, like rice, corn, beans, potatoes, and sweet potatoes, everything will fall into place. You will now think: It just makes so much sense now. The program is easy to follow, the foods are delicious and satisfying, the excess body fat disappears, the bowels work, my laboratory test results are now great, and my mental and physical energy have become boundless. Most importantly, with starches at the center of your meals, you feel a sense of wellbeing and control. You have finally come home to your food. This way of eating is for life. Referring to my dietary recommendations as vegetarian, vegan, plant-food-based, or high-carbohydrate is correct, but not sufficiently specific. Vegetarian means that meat is eliminated. Most people would include eggs and dairy products in a vegetarian diet and many would also allow fish (or chicken). A vegan diet avoids all foods from animal origin, but can still be based on Cokes, potato chips, and vegan cheesecake. At least half the vegetarians and vegans I know are overweight and unhealthy because of all the soy meats and cheeses, olive oil, nuts and seeds, simple sugars and refined flours they eat. A plant-food-based diet could mean lettuce, kale, broccoli, and cauliflower, and therefore, a lifetime of hunger pains and fatigue from lack of energy. And table sugar is a high-carbohydrate food: enough said. The word “starch” conveys exactly what you are supposed to eat. What I love best about your focus on starch in this lecture is that it’s much simpler for me to understand than focusing on carbs, proteins, and fats. I know what a starch is; I can recognize that food easily. And I can grow starchy foods in my gardens. But how do I grow a protein, a carb, or a fat? Those explanations were always too far removed from what I see on my plate. Plants synthesize and store carbohydrate in their roots, stems, leaves, flowers, and fruits. Some plant parts, like the seeds (grains and legumes), roots, and tubers concentrate very large amounts of starch in the form of stored energy. This fuel will serve to sustain the plant’s parts during the winter and provide the energy for reproduction during the next growing season. Starch supports the germination of grains (rice and corn) and legumes (beans), and the sprouting of tubers (white potatoes) and roots (sweet potatoes) in the springtime. In practical terms of the foods on your plate, starches are plant parts that contain very large quantities of carbohydrate and therefore can sustain human life. Non-starchy green, yellow, and orange vegetables are too low in energy; you would have to eat two bushel basketsful of cabbage to get sufficient calories to make it through the day. Fruits are plentiful in calories, but they are mostly simple sugars that fail to provide sustained appetite satisfaction. Grains: Barley, buckwheat, corn, millet, oats, rice, rye, sorghum, wheat, wild rice, etc. Legumes: Beans, peas, lentils, etc. 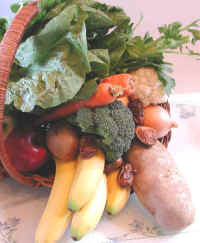 Starchy Vegetables: Carrots, Jerusalem artichokes, parsnips, potatoes, salsify, sweet potatoes, winter squashes (acorn, butternut, Hubbard, banana), yams, etc. 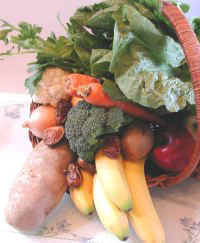 Green, Yellow, and Orange (Non-starchy) Vegetables: Bok Choy, broccoli, Brussels sprouts, cabbage, cauliflower, celery, chives, collard greens, eggplant, garlic, green beans, kale, leeks, lettuce, mustard greens, okra, onions, peppers, radish, spinach, summer squashes, rhubarb, scallions, turnips, zucchini, etc. Fruits: Apples, apricots, bananas, berries, cherries, grapefruit, grapes, figs, loquats, mangos, melons, nectarines, oranges, papayas, peaches persimmons, pineapples, plums, tangerines, watermelons, etc. Plants make basic carbohydrates (simple sugars), like glucose, by combining water and carbon dioxide with energy derived from the sun in a process called photosynthesis. 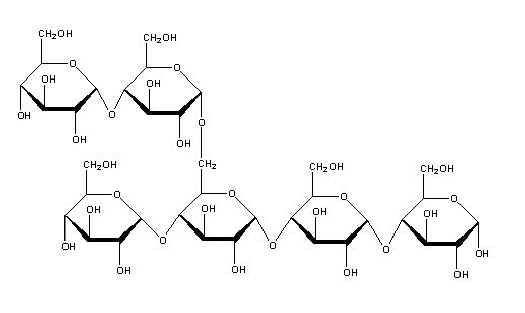 The sugars formed are then linked together in long linear (amylose) and branching (amylopectin) chains. These chains of sugars then aggregate within the cells of plants to form starch granules (grains) in their cytoplasm. 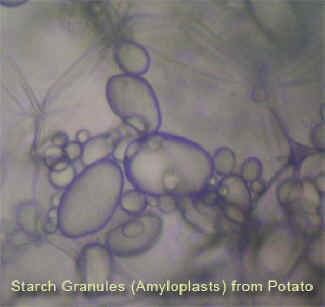 The starch granules are located in chloroplasts of green leaves and in amyloplasts of seeds, legumes, roots, and tubers. Starch granules examined under a microscope differ in size, shape, and markings depending on their plant source. Potato starch granules are smooth-surfaced and oval, while corn, rice, and wheat starch granules are less smoothed-surfaced, angular and pentagonal. Potato starch granules are about two to three times larger than wheat, corn, and rice starch granules. 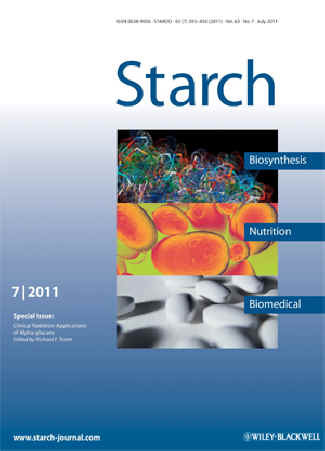 Starch is the main source of digestible carbohydrate in the human diet. During the process of digestion, the enzyme amylase, which is found in large quantities in human saliva and the intestine, breaks these chains into simpler sugar molecules. The digestive processes are slow and result in a gradual release of glucose from the small intestine into the bloodstream. Eventually, large amounts of glucose enter the body. Most of the starch consumed by people will have already been cooked. Cooking starts the breakdown of starch granules. Starch in its pure form is a white, odorless, tasteless, carbohydrate powder. Starch granules are not soluble in water, but when heated in water the granules swell and gelatinize. When cooled, this gelatin sets into a paste, which can be used as thickening, stiffening, and gluing agents. The word "starch" is derived from a Middle English word, sterchen, meaning to stiffen. Starch is a principal ingredient in laundry products, medicines, cosmetics, and powders. Papermaking is the largest non-food application for starches, worldwide. The construction industry uses it to make gypsum wallboard, stucco, and various adhesives or glues. In the food industry, starch is used to make corn syrup, which is used in table syrup, preserves, ice cream, and other confections. Thickeners and stabilizers made from starch are used in puddings, custards, soups, sauces, gravies, pie fillings, and salad dressings. The central role of starch in human nutrition has been forgotten. All large populations of trim, healthy people, throughout verifiable human history, have obtained the bulk of their calories from starch. Examples of once thriving people include Japanese, Chinese, and other Asians eating sweet potatoes, buckwheat, and/or rice; Incas in South America eating potatoes; Mayans and Aztecs in Central America eating corn; and Egyptians in the Middle East eating wheat. My book, The Starch Solution, will serve as a manifesto to help reverse current health trends. Worldwide, people are fat and sick because of their dependency on meat, dairy, eggs, and oils for calories. The all-too-real changes we are presently experiencing in our climate are being fueled in large part by pollution from the livestock industry. An amazingly simple win-win opportunity stares us in the face: a global switch to a starch-based diet will solve the diseases of over-nutrition and put a big dent in global warming with one U-turn.